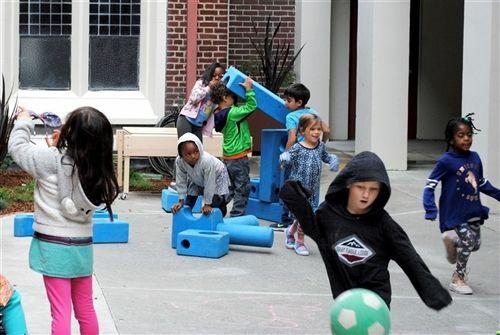 Designated areas for eating and playing in the kindergarten courtyard create clear boundaries for where to be still… and where to let loose! Once we’re here at school, we want to feel supported in our quest for learning. Kindergarten teachers kickstart respect and kindness in our community during Morning Meeting, a Responsive Classroom model that continues through fifth grade at St. Paul’s. Students enter the classroom with a series of steps to settle them into quiet table tasks, then join the teachers seated in all different ways around a circular rug to prepare for learning. Teachers lead a sequence of songs, games, and sharing moments as the students find their comfort -- and readiness -- within the circle. Morning Meeting allows teachers to recognize what students are experiencing as they approach their academic day. The kindergarten community continues to build as both classes meet for snack and lunch in their newly renovated courtyard. Over the past summer, Tracey Cosgrove worked with the St. Paul’s Church to design a space that can be shared in ceremony and contemplation, breaking bread, and even some controlled chaos during kindergarten snack and lunch. You’re welcome to check out St. Paul’s newest look at the Parent Welcome Coffee in the Kindergarten Courtyard this Friday from 8 to 10 a.m.!